In a previous blog post, Entrepreneurial vs Consumer Mentalities, we spoke of the great need in the United States for the creation of new small businesses as an imperative part of a sustainable economy. The Stay Ready Studio in Houston, Texas is an excellent example. A few years ago Cynthia "ccain68" on YouTube, dissatisfied with the quality of products and service she was receiving from some local nail salons, decided to learn to do her own acrylic nails. Her experimental nail videos were a welcome addition to her already popular YouTube montage of hauls, friend tags, cosmetic reviews, weight loss tips, rants, rambles and "Look Good Fridays". Taking the popular concept of, "Stay ready so you don't have to get ready," and combining it with her her previously untapped talent for nail artistry, Cynthia opened the Stay Ready Studio at the end of 2014. Because of the tremendous natural disaster occuring in Houston, Texas, the Stay Ready Studio, like many small businesses in Houston, had to close temporarily until floodwaters receded. They are open again but unexpected closures such as these affect the income that small business owners depend on. If you live in the Houston Area please support your local small businesses. 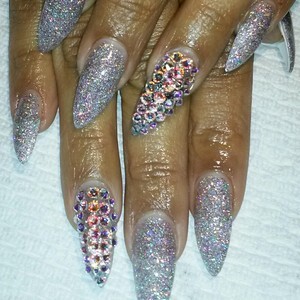 Make an appointment with Cynthia - Licensed Nail Technician & very talented artist. There is also a hair salon at the same location.